After a challenging journey through the whole 2018 December will become a port of tranquillity you have dreamt of. Whether you want to shovel piles of gold coins hidden in cellar or if you are looking forward to shovel large piles of snow away, you will surely be pleased with it; and be sure you will drench few shirts with sweat during that time. December is a good opportunity to evaluate the whole year, albeit it may be a bit premature estimate. The horoscope urges Aries: "Now is the time to anchor and not to sail on the open sea." 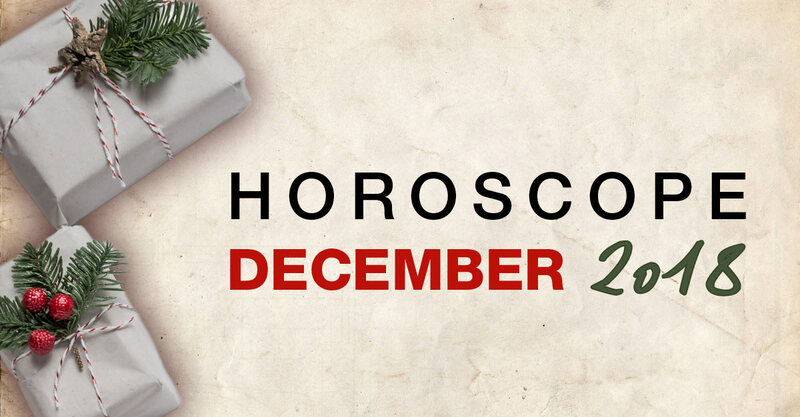 The December horoscope for Taurus highlights several important points. People born in this zodiac sign will experience a rare increase in their ability to predict future events. Even the mighty Cassandra could envy you. Secondly, the key moment will be a lack of space. Even if you would live in a large palace, you would still feel constricted. And to the third, the Christmas rush will exhaust Taurus more than it did in previous years. Thus, be careful to finish the year 2018 really peacefully. Gemini, the heavens are not just the place of snowing, raining, or the sun shining. It is, in the first place, an eternal spiritual world that opens the gateway to the vast distances of the entire universe. Gemini, the end of 2018 will be linked to several meetings aimed to support your mental development and the spiritual pleasure. Love and the feeling of belonging will become a kind of a miraculous "powder" that can calm your mental irritation a lot. In December, you may choose new location that will be your new home or at least a religious starting point for the next upcoming season. According to the horoscope for December 2018, Cancer will, with great passion, appreciate experiments of all kinds. From body delights (French perfumes, spicy Asian meals and daring sexual practices), physical and chemical experiments in the lab, to long exotic journeys or demanding alpine tourism. In other words, a shy and often too conservative "birdie" stretches out the wings and turns into a real predatory eagle. The December Horoscope reveals that the courage of Cancer is a healthy sign and will be crowned with success in the vast majority of cases. Differently coloured fibres are good for knitting a colourful sweater. However, in the case of very diverse tasks that Leo is facing, they rather obtain shape of a chaotic tangle. Thus, Leo may be easily confused. Making complicated Persian rug out of thousands of threads is a great art, while entangling countless threads together can really everyone. December horoscope warns Leo that you will face many tasks and duties at once in the last month of 2018. However, if you can rely on your close friends and colleagues, you will certainly win this tough battle. In December, Virgo should not rely on excellent elephant's memory. Memories may often deceive you, and impressions of events that took place five, ten or twenty years ago can be as changeable as the chameleon's skin. Maybe someone who you did not saw since the kindergarten may be asking you for a favour; maybe you will have to testify in a long-forgotten criminal case; maybe you will not remember where you hid the last key to safe. The Horoscope advice is following – Virgo, keep in mind that your memories can sleep hard and it will not be easy to wake them up to speak to you truthfully and soberly. December will verify how strong your bones are. Libra, you can fall from a height when removing a ton of snow from the roof. The curtain may fall on you during a theatre performance. Or you may simply hurt yourself while enjoying passionate love. Libra, whether you will climb on a tree or try all the secrets of Camasutra, you should simply watch out for yourself. The December horoscope warns: Libra will not miss courage, but sometimes the necessary luck. To unite, not to divide, that's what's matter in December, hopefully Scorpio would agree. Even with the knowledge that Scorpio is a zodiac sign that likes to act mostly on his/her own. In 2018 the December horoscope brings an ideal opportunity for all people born under Scorpions to try what it feels to be like a grain of rice in the midst of a two-pound sack of this nutritious crop. Simply, it requires a lot of humility as well as confidence. However, knowing that you are part of strong and valuable society, family or other collective. In December, according to horoscope, the Fool tarot card will become an ideal guide for Sagittarius., In the last month of 2018 you should prescribe a proper break to yourself; you need rest and take deep breath till the next year's start. Than the whole hustle and bustle will start again. Treat yourself with a certain amount of foolishness. Leave your mind simply levitate in a state of weightlessness. Sagittarius should not make any fundamental decisions in December 2018. What can be postponed, simply postpone, the horoscope says. And everything urgent decide in the morning, not in the evening. Capricorn, give yourself something "natural" as the Christmas present. If the right woollen sweater itches, a string of wooden beads is enough. December is, according to horoscope, the best time to reconnect you with pure nature and thus bring a new talisman into the life of Capricorn. Bold individuals may also cease to use cost-saving light (LED) and use old candles instead, or start writing with an ink filled pen as a substitute for keyboard. You will find that new and "modern" does not always mean better; surprisingly, this also applies to relationships. How to capture and mediate your own thoughts to others? The awkward Latin word for this activity is "verbalization". Aquarius Horoscope highlights some clumsiness in your turn of phrase; people born in this sign may feel naked and embarrassed during conversations. Be careful what do you say and how do you formulate crucial ideas. If you have any secrets, you might disclose them just by mistake. If you prepare a gift for your beloved counterpart, such surprise can accidentally leak out. But, on the other hand, if Aquarius deliberately plans to do something unfair, the harm can be even greater. Pisces, if you had to choose between a small glass of milk and an endless river of champagne poured into a golden cup obtained in a winning tournament, you will probably (and surprisingly) choose the first and modest option. Pisces, the whole 2018 ends in December. And this year can be considered as one big victory itself. However, you do not need to celebrate and therefore be drunk. People born in Pisces are completely satisfied when looking into the mirror where they see a person who is trying to live honestly. This "race" of virtuous life is very exhausting, and if you are winning you can be happy.